Love it. We have had other rain gauges but they always break. This one is taller and so far has weathered spring storms just fine. Would recommend to cat lovers. I put this in my garden to replace an old rain gauge. It is super cute! The only downside I see is that it already has rust spots on the back; I've had it about a month. Was disappointed when arrived was not packaged properly most parts were crooked and umbrella could not be inserted into hole, only part way but it was so cute. Cheap China crap. It's very cute but started rusting within a month. We put it inside for the winter. Not even a year later and we've glued the arm holding the umbrella twice, the paint is faded and whole back is rusted. Today it got thrown out. Purchased in May 2018. My daughter loves cats and she will get a thrill putting this in her yard. It's a cat and he's cute. I have 5 cats buried outside. 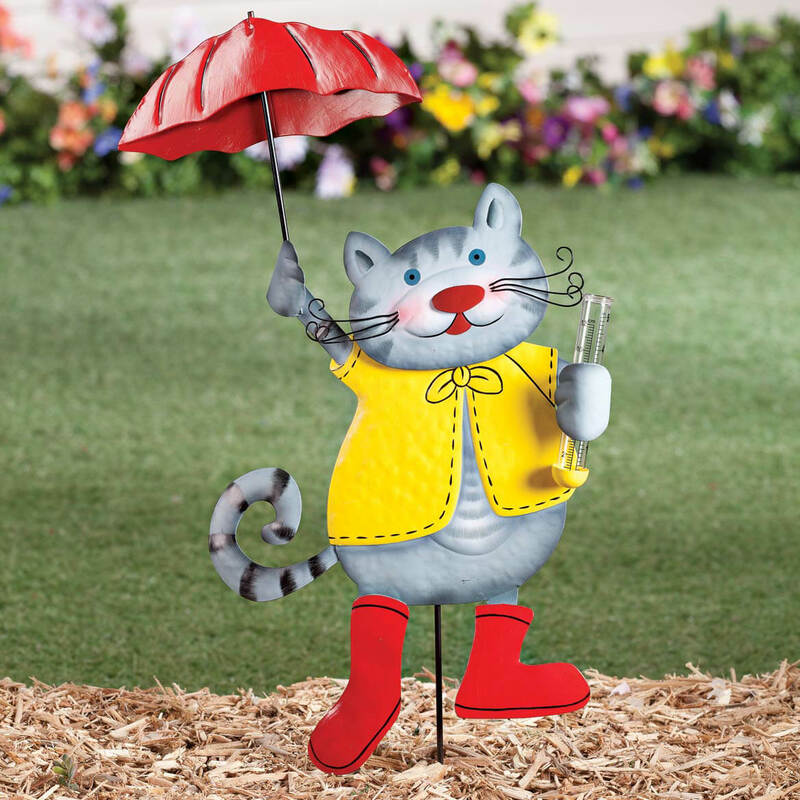 The kitty range gauge will be a cute addition to our yard. It's so cute for my grandson's garden! My friend loves her garden and her cat! looks like a colorful item for the garden. And besides, my wife likes cats! So cute! Will make a nice addition to my garden. It is adorable! Mama Gert will love it! It will look cute in the yard. 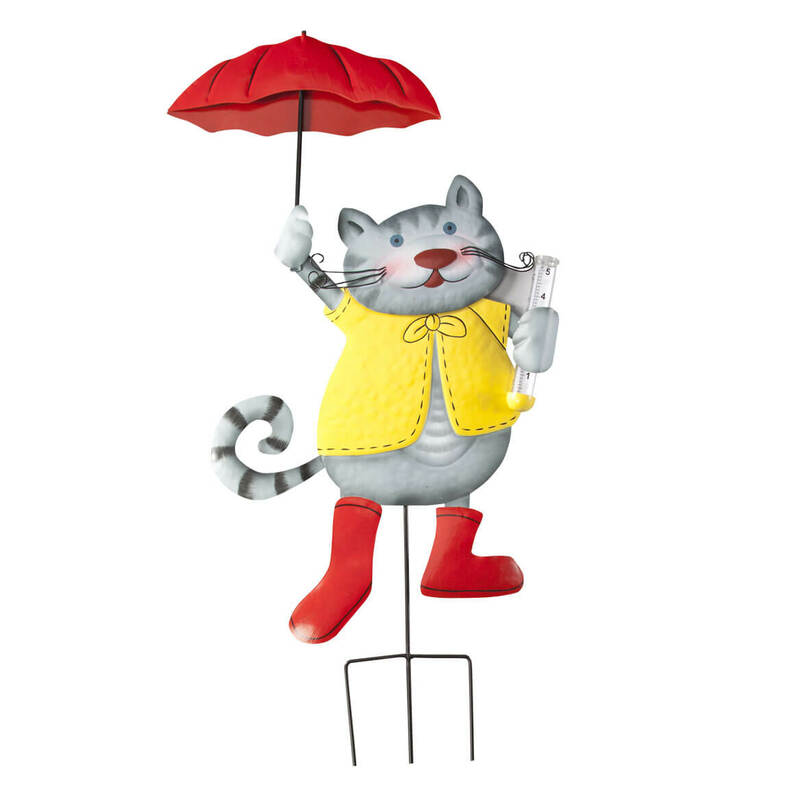 Because it matches the frog statue I have that's dressed in the same yellow rain slicker and red galoshes, except that his red umbrella is turned upside down with a red bird sitting on the handle. I plan on putting this right next to it. So cute as a pair. Needed a new rain gage. So cute and looks like one of my cats! Like that it has a rain gauge too.